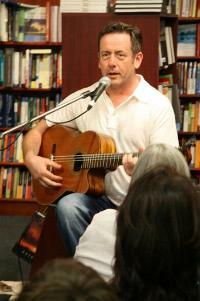 Luka Bloom (born Barry Moore) comes from a family of singers and writers. He first went on tour at age fourteen with older brother, Christy Moore, in 1969. That was a long time ago. Thirty-six years of craft honing has secured Luka a place on the international music map. He has taken his songs to clubs, theatres, festivals, bars, arenas and dives all over the world. An inspired and inspiring performer, his literate and melodic original songs, sensitive interpretation of others and impassioned live performances have earned Bloom a devoted Australian following. Right now Luka is in training for his return to Australia in March 2007. He says, "in truth, I spend 2 months out of 24 in Australia and the next 22 waiting to return." 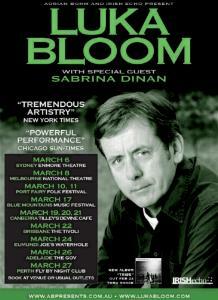 Adrian Bohm and Irish Echo present Luka Bloom in concert with special guest Sabrina Dinan. second concert with special guest Sabrina Dinan. OR National Theatre box office on 9525 4611. 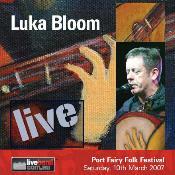 Luka Bloom (born Barry Moore) is an accomplished Irish folk�rock singer songwriter. Coming from a family of singers and writers, he first went on tour at age fourteen with older brother, Christy Moore, in 1969. That was a long time ago. In 1987 Barry Moore flew out to America and Luka Bloom came back. Luka has brought his songs to clubs, theatres, festivals, bars, arenas and dives all over the world. Thirty-six years of craft honing has earned him a place on the music map and a devoted Australian following. He is currently putting the finishing touches to a DVD and releasing his new album Tribe, a collaboration with Dubliner Simon O�Reilly. This is Luka�s eighth tour to Australia. He says, "�in truth, I spend two months out of 24 in Australia and the next 22 waiting to return�"
Next March, the beautiful fishing village of Port Fairy hosts the 31st Port Fairy Folk Festival. Tickets go on sale this week - most will sell out in just a few weeks. 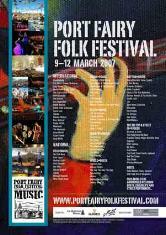 Port Fairy Folk Festival is one of Australia�s longest running and most successful music festivals. In 2007 it presents over 100 acts including 22 international acts. There is also a huge street festival with free stages, "Street Invaders", buskers and markets. The Festival Director, Jamie McKew, said, "We have a great line-up for 2007 featuring festival favourites from around the world. Ralph McTell asked to return to Port Fairy on his farewell tour; Lúnasa - the best Irish band on the planet - are back and we present for the first time the legendary Irish troubadour, Luka Bloom." Festival Chairman, Bruce Leishman, said: "The festival has become a model community project. It has led to greater community spirit and supported just about every charity in the region. It brings great happiness and pride to our region." Around 20,000 people a day (80,000 visits over 4 days) enjoy four days and three nights of music, dance, workshops, street performances, theatre, busking, craft fairs, a Children's Folk Circus, the Free Festival of the Streets, and the many local tourist charms of the historic coastal fishing village. Plus more to be announced including hosts, children�s and street performers. "Irish music has been a part of Port Fairy ever since the first days of European arrivals. The Celtic muse, the songs, the wild fiddle and high whistle have always been a part of this festival. You have to ask if there is better music on the planet," mused director, Jamie McKew. The international line-up of Irish players alone reads like the history of the best of the best of the recent era of Irish folk music and all its branches. The point is well made by the inclusion of early luminaries such as fiddler, Kevin Burke of the Bothy Band; Uillean Piper Paddy Keenan of Bothy and Moving Hearts. 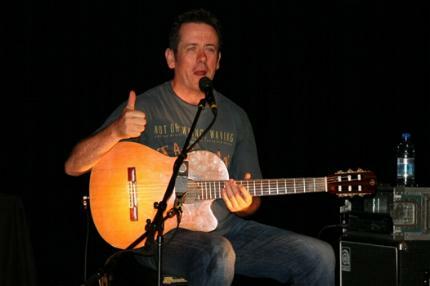 Top that with legends Luka Bloom and "the best Irish band on the planet", Lúnasa. To complete the picture the new generation in the person of Gavin Moore also takes the stages. Gavin is the nephew of the amazing Christy Moore and Luka Bloom. From Newbridge, County Kildare, 36 years of music later and you have the essence of musical Ireland in one fine troubadour. The songs are filled with stories of love, lonesomeness, solitude, soul-shine and life. Luka has quality and passion as beautifully told in his latest album Tribe. The County Clare singer, a rising star around Ennis, regularly plays support for the likes of Mundy, Roesy, Paddy Casey, Damien Dempsey and Aussie legend Paul Kelly. She tours to Australia with Luka Bloom. Born into what is arguably Ireland�s most famous music family, Gavin Moore respects the influences of his uncles Christy Moore and Luka Bloom, but musically, this singer is most definitely his own man. Gavin�s distinctive, soulful voice, with its great range, sets him apart, not just from the sound synonymous with his family, but also from his peers. His collection of songs to date reflect sensitive observations on life, about coming of age, self-discovery and awareness. Visit www.portfairyfolkfestival.com for more information. Free - No bookings needed. as part of his celebration of his new album Tribe. Get here early! Luka and Simon O'Reilly, a wonderfully rich earthy sound. Excitement is building in the Mountains as the cream of international and national musicians and performers start arriving in Katoomba for the 12th Blue Mountains Music Festival of Folk, Roots & Blues. Scheduled across this St Patrick's Day weekend from March 16-18, the 2007 festival has a fitting celtic line-up that includes some of Ireland's most enduring and beloved musicians. The legendary Luka Bloom leads the charge and has spent 36 years honing his craft. A regular vistor to Australian shores, Luka comes from a family of singers and writers and stands side-by-side with older brother Christy Moore in the annals of Irish music history. The simple power of singer/songwriters holding an audience spellbound quickly erased all complications at a dramatic Blue Mountains Music Festival on the weekend. The 12th festival could have been mistaken for an unlucky 13th when the marquee on the main stage collapsed on Friday afternoon. While this forced organisers to temporarily halt ticket sales for safety reasons, a new marquee was soon installted and the goodwill of audiences had the festival soaring again. English folk legend Ralph McTell had enthralled folk fans singing in unison to his "medley of hit", The Streets on London on Saturday night. Earlier in the day Irish troubador Luka Bloom joked the misty Katoomba rain was his St Patrick's Day gift to the festival. Headline act Luka Bloom used more subtle means to charm the packed audience at his Saturday afternoon show. The Irish singer-songwriter left the Mountains with a of new fans despite performing while the Katoomba mist descended and rain fell. An uplifting and different night of music guaranteed from much-loved and highly acclaimed Irish singer-songwriter Luka Bloom. An inspired and inspiring performer, his literate and melodic original songs, sensitive interpretation of others and impassioned live performances have earned Bloom a devoted Australian following. Right now Luka is in training for his return to Australia in March 2007. He says, "in truth, I spend 2 months out of 24 in Australia and the next 22 waiting to return." He�s fresh out of the recording studio with the album Tribe and I�ve got to love a man who describes his latest release to me by admitting that, "I�ve always had a fascination with pretentious music." After a history of eclectic musical endeavours ranging from a stint with The Violent Femmes to an entire album recorded for insomniacs, Luka has returned with his latest little nugget, a collaboration of his own vocals alongside the instrumental delights of Simon O�Reilly. "To be really honest, I have no idea how to market this album," Luka explains. "It�s a little bit of everything. There�s an ambient, trippy kind of feel to it, but then it also gets quite unexpectedly political." We can expect a few guest performers on Tribe, including Luka�s own 22 year-old son who is, like his father, "a beautiful singer". Known for his infectious personality and intimate shows, Luka is a favourite amongst the Tilley�s music crowd. Okay, so I think my mum�s got a bit of a crush on him, but if you like witty Irish banter and acoustic delights, then Bloom is your man. 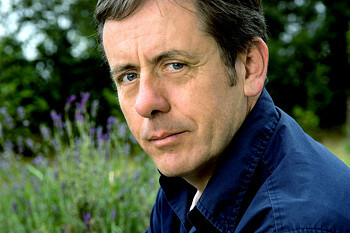 Irish singer-songwriter Luka Bloom started off life with the name Barry Moore, and took his by now well-known alias to avoid constant associations with members of his family. Not that he was trying to hide from anything insidious - just that when your brother is Irish folk legend Christy Moore, it�s hard to escape from such a massive shadow. 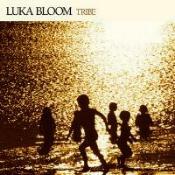 So he took the name Luka Bloom ('Luka' from the Suzanne Vega song of the same name, and �Bloom� from the main character in Joyce�s Ulysses) and set about carving his own niche in the musical world, an odyssey which has just seen him release his tenth studio solo album Tribe. "We were all singers in my house, and I was writing songs from when I was about 12," Bloom explains of his musical heritage. "I performed them at home, and at school and at concerts. We did pretty well on a televised competition with school when I was about 14. It�s all I�ve ever done - I�ve never had a job. My son�s about 24, and I�m always telling him that I still haven�t worked out what to do when I grow up." "It came down to not having a choice really, and I really did struggle for a long time. But I was inspired by so much music: things like Neil Young, Bob Dylan, James Taylor, Joni Mitchell - basically just sad bastards with guitars. That�s the sort of stuff that got me going." I was forced to head over to the States pretty early on out of pure desperation. In 1986 Ireland was a pretty grim place, and a lot of people were emigrating. There were no job prospects, no employment and no interest in songwriting. I gave myself two years to make it work, after which I was going to go and get a �normal� job. Luckily right as that time elapsed things started happening, and the rest is history." While Bloom travels the world as part of his job, he has always had a significant rapport with Australian audiences - one which began when his cover of LL Cool J�s 'I Need Love' was a smash hit here in the early 90s. "That song hit the Top 20 in eight different countries," Bloom recalls. "I remember my first tour to Australia was in 1991 [Nov 1992], and now this is my ninth [8th] tour coming up! That really created an audience for me here in Australia, and I just keep coming back for more because I love it down there. Australia is my blessed land." "There were other countries like England where I couldn't get a gig, and then I arrived in Sydney for my first gig and there were 2000 people there! I couldn�t believe it! I�d only just arrived in the southern hemisphere and I was dying of jetlag, and it was just like 'Who told these people? This is not supposed to happen to me! I�m supposed to struggle and scrape for two years in each country, and then get invited to do a theatre or a club'. I really had an immediate audience down there - things really do happen upside down in your country!" 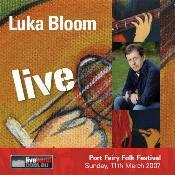 Luka Bloom plays The Tivoli Thursday 22 March. Tribe out through Big Sky Records/Shock. Tickets on sale now @ Joes Waterhole $46. Everything that's happening in Adelaide this fortnight. Currently putting the finishing touches to a live DVD, Luka Bloom is also getting ready to kick off his ninth [8th] Australian tour later next month. Look out for new album, 'Tribe', when it hits the shelves to coincide with his upcoming tour, then head on down to the Governor Hindmarsh on Mon 26 March. 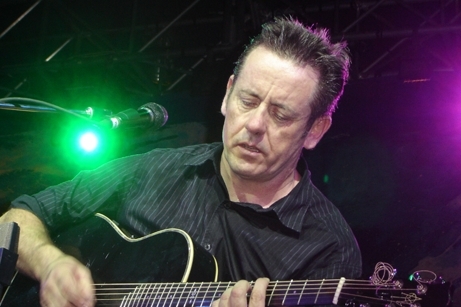 Irish singer songwriter Luka Bloom - the younger brother of Irish music legend Christy Moore - is coming to town as part of Adelaide Fringe 07 armed with a brand new album, Tribe. 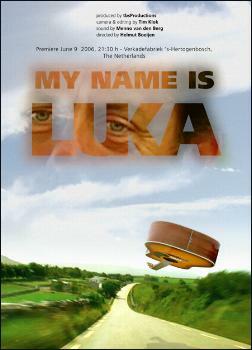 A regular visitor to this country since the early �90, Luka will be undertaking his first visit for a couple of years. "And I can�t wait to get back," he said over the telephone from home in Ireland late one night. "Why wouldn�t I for God�s sake? " "And, fortunately for me, people in Australia are still gluttons for punishment," Luka added with a laugh. "It�s tour number nine [eight] for me and I�m pushin� for 10. But it�s a nightmare flying these days with all the pain in the arse security." The singer songwriter�s latest album, Tribe, marks somewhat of a departure for it was written and recorded with Country Clare�s Simon O'Reilly after Luka had heard Simon�s instrumental Tide Lines album. "It is a total departure," Luka readily agreed, "but it�s an album I�d be wanting to make for a long, long time. Simon had made a beautiful instrumental album that someone had sent to me and I just loved it. So I contacted him and said I�d like to work with him. So Simon created all these sounds and then posted them to me - and I mean he literally posted them to me as CDs because I'm a bit of a Luddite - and then I made up the songs from his music. It was lot of fun and very enjoyable." Luka�s trademark guitar only appears on two songs. "Yeah, it�s most unusual for me to just be singing," he said. "But that was also something I wanted to do." Robbie Moore, Luka�s son, adds backing vocals to the title song. "That happened quite by coincidence," Luka said. "The studio [Black Box] where we recorded my vocals was in France and only an hour away or so from where Robbie is studying at university. So I invited him over and he gave it a go." Luka is travelling with special guest Irish-born opening act Sabrina Dinan who has been winning rave reviews for her performances in Australia. "Yeah, Sabrina�s amazing," Luka enthused in conclusion. "She spent a good while or so in Australia some time ago, but this will be her first big tour." 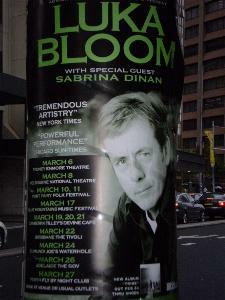 Luka Bloom plays the Governor Hindmarsh on Mon Mar 26 with special guest Sabrina Dinan. Luka�s latest offering, Tribe, is out now through Shock. ninth tour to Australia in March 2007.
earned Bloom a devoted Australian following. out of 24 in Australia and the next 22 waiting to return�" And he is! ...Luka spent the ensuing 18 months since launching 'Innocence' in Australia in February 2005, touring constantly in Europe and the US. He is currently putting the finishing touches to a DVD which will consist of a live show in Dublin, and a small gig in his home filmed this summer. Luka now heads to France to mix his new CD 'Tribe', a collaboration with Dubliner Simon O'Reilly. This album is completely different from anything he has released before and Luka is keen to see what Australian audiences make of it. It is hoped the album will be ready for release by March 2007. LUKA BLOOM: Not only a tremendous guitarist but also a mesmerising performer, LUKA is one of the rare showmen who can fill two hours at ease with only a guitar in his hands. And in between, he knows how to mark himself with some funny blinding lyrics. SABRINA DINAN: The minute you hear her sing you will know you're in the presence of someone special. The smoky warmth of her voice is irresistible. Her songs range from upbeat passionate to so gentle and fragile that the audience seems to hold its breath during the intricate guitar picking. The cat is out of the bag...LUKA is playing at KULCHA! to experience LUKA's music in the intimate setting of our wonderful venue. Numbers are strictly limited so you'll need to be quick! Price: $25 Presale, Doors open 7.30pm, show starts at 8pm. Bookings open to KULCHA MEMBERS today until 5pm. 06 March 2007 Enmore Theatre, Sydney - Anne E.
15 March 2007 The Basement, Sydney - Sarah Gregson & Anne E.
Losing weight without starving yourself may seem like a real challenge, but we have the tricks to kill those hunger pains while dropping the kilos. Effie Zahos talks family finance, Irish folk singer Luka Bloom performs an "electro-acoustic" number and we tell you how to spot a genuine Louis Vuitton from a cheap imitation in our handbag fashion parade. Also, today, Ian Wallace discusses the benefits of eating as a family and the surprising impacts of letting the kids cook. And you�ll be amazed at the physiques of two Australian junior bodybuilding champions. working alongside some of the best including the Dixie Chicks and Lou Reed. 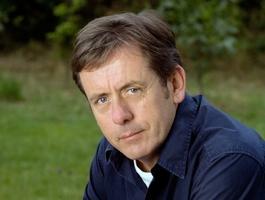 Now Luka Bloom is back in the country and joins us this morning. He performs a track from his latest album TRIBE. When touring Australian in 2005 Luka said: "I really love coming to Australia. I think there's a deep empathy between Australians and the Irish, something hard to define, but probably evident within our similar, self-effacing sense of humour. I do always feel at home there."